I've been knitting for a very long time and one thing that amazes me is that I'm still learning new techniques - new to me, at least. I'm pleased about that. I'd hate to think that there is an "end of the road" where you know it all. Where's the fun in that? Where's the challenge? What would keep me interested? I just learned how to do the Tubular Bind Off and I like the result, although I've had a couple of problems along the way. The problems were all mine, not the technique. I found that dropping a stitch back a few stitches and down a couple of rows, then trying to go back to pick it up is a pain. 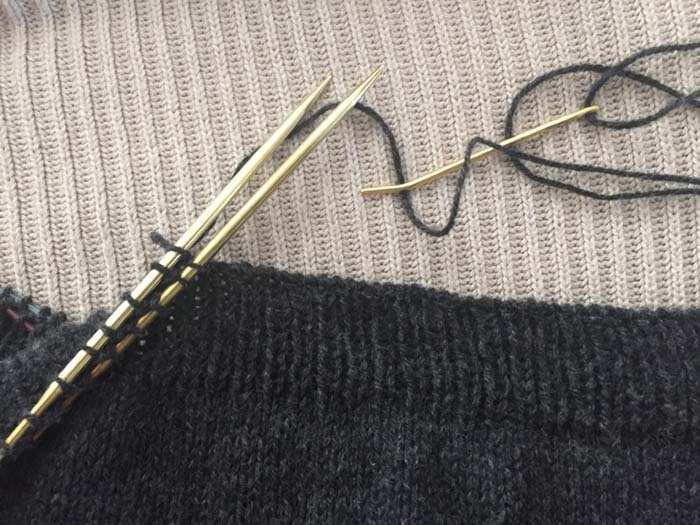 Basically, you're putting your ribbing onto two needles. For my K1, P1 ribbing I put the knit stitches on the front needle, the purl stitches on the back needle, then join using the Kitchener stitch. I have no problems with the Kitchener stitch. It's well-stuck in my brain. However, it's not a good idea to try to do it (over a total of 260 stitches) when the yarn is black (with a slight halo), it's late and I'm tired and two light bulbs (out of 4 in the lamp) have burned out and I'm trying to avoid replacing until the next day - not a good combination. For so many stitches you need to leave a long tail to do the Kitchener stitch. I went overboard and could have grafted about 1000 stitches, so the tail was constantly getting twisted and tangled. After redoing the tubular bind off a second time I've learned my lessons. I'm working on the top-down Machu Picchu sweater and I wanted a bind off that didn't flare at the waist ribbing. This one seems to be doing the trick. I found excellent instructions by KnitPurlHunter. She's a good teacher, her videos are clear and a great resource. This is a bind off that is stretchy and looks good. I'll be using it often. It should be easier to bind off the cuffs on the sleeves when I get there. I hope so. Like I said, I've learned my lessons. And are those Heavy Metal needles? I must check them out. I don't like signatures for some reason. I bought a whole set of Dyak DPNS in the smaller sizes (wood) and like them very much. Hi Mary Lou.... They are two Addi Turbo circular needles. I like wooden needles as well and my current favorites are the Dreamz. For DPNs I haven't bent one yet.